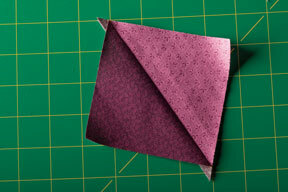 There are many specialty tools for making half square triangles (HSTs). 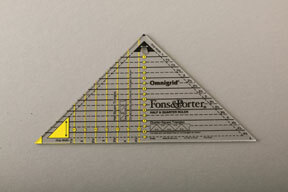 We'll show you how to use Fons & Porter's Half and Quarter Ruler by Omnigrid, the Wonder cut Ruler, Brenda Henning's Triangulations software, and June Tailor's Perfect Half and Quarter Square Ruler. There's a good chance you have one of these hiding out in your sewing room, but never used. Brush off the dust and try it out again! As we mentioned last week, specialty rulers can be fun and easy, but only if you use them regularly enough to remember how they work. And don't miss the attached videos that demonstrate these same tools. Sometimes live action is just easier, but you can pick which works better for you. Pros: You don’t have to know a magical formula or do any math. The little tips will be pre-trimmed on one side so you have less trimming to do later. This little gem also makes Quarter Square Triangles, but that’s another lesson. Cons: Unless you use it often, or have an excellent memory, it takes a few minutes to orient yourself with how to use this ruler. As in Method One from last week, you have a long bias edge that can be accidently stretched out of shape. Decide what size finished square you want. We’ll use 3 1/2" finished for this exercise. Finished means the size of the square after it’s been completely sewn into a quilt (no raw edges left). Turn the ruler sideways so you can read the instructions for HSTs (without tilting your head), as shown. Look at the yellow lines that are running left to right – identify the finished measurement you want. We’re looking for the yellow 3 1/2" mark for our finished size. Following along that same yellow line, look to the left side of the ruler and you’ll see that the strip width needs to be 4" wide. 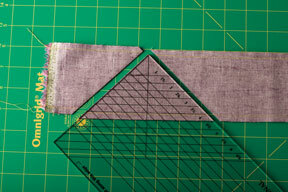 Using a regular ruler, cut two strips of fabric 4" wide, one of each contrasting color. Layer them rights sides together (RST). Position the Fons and Porter ruler on the fabric for the first cut, as shown. Align it on the yellow 3 1/2" line. Be sure the little yellow corner spot is hanging over the edge of your strip. Cut. For the second cut, reposition the ruler at an opposite angle, as shown, again being sure the little yellow corner tip is hanging over the edge of your strip. 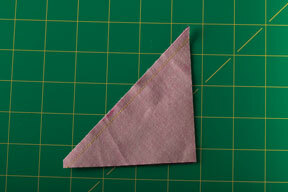 Keeping your triangles in the same position you cut them (RST), sew together on the long edge. Carefully press the seam allowance to the darker fabric. Done! Note that half the triangle is already pre-trimmed for you! 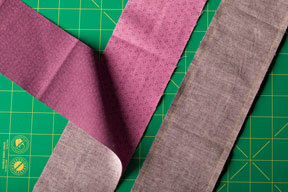 The key to this method is pre-sewing your strips together. 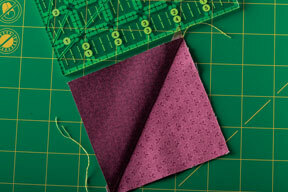 Pros: No worrying about raw bias edges – they are sewn in before you handle them! You can make a bunch of HSTs without stopping. You don’t need a magic formula or do any math. 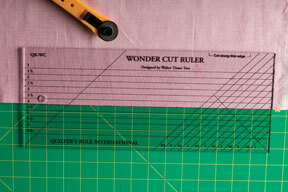 The ruler is long enough that you don’t need any other rulers to cut your strips in preparation. Cons: As with any specialty ruler, unless you use it often, you’ll forget how and it takes a few minutes of orienting yourself before you begin. Note, don’t try to make any of these steps using a regular ruler. 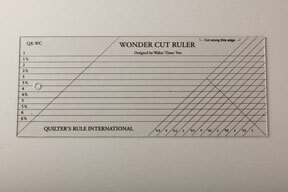 You have to trust the pre-marked lines on the Wonder Cut Ruler. If you try to transfer the logic to a regular ruler, you’ll have a mess…trust us, we tried! 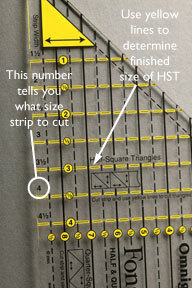 Decide what size you want your unfinished HSTs to be. Unfinished means the triangles are assembled into a square block, but not yet sewn into a quilt, so there are 4 raw edges to your square block. In our example, we want 3 1/2" finished, so we need 4" unfinished. 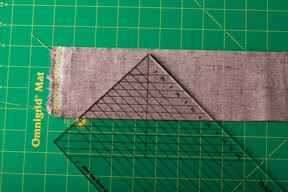 Using the long edge of the Wonder Cut Ruler, cut a strip of fabric 4" wide. Note the marking on the ruler that says “Cut on This Edge”. If you cut both of your contrasting colors at once, layer them RST to save you a step later. 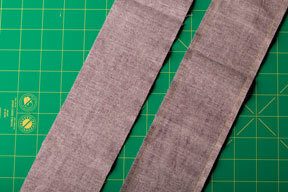 Sew the strip, like a tube, 1/4" seam allowance on each side, as shown. 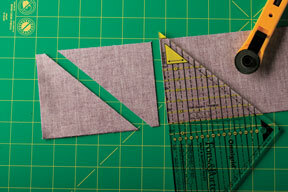 Unfold each square, but watch for a tiny bit of stitching in the tips – if your cut wasn’t a perfect 4", or your seams weren’t perfect 1/4" seams, you might have a couple of stitches in your tips. No worries! Just gently remove the stitches with a seam ripper (or even just your fingernails). Gently press the seam allowance to the darker fabric. Cool, huh? Pros: Super fast, no math method for making large quantities of HSTs. Since you print the size you need, on demand, you don't have to store anything except the software. No complicated executable files to deal with. Just open the software, find your size and print. This method is great if you don't trust your 1/4" seams! Cons: If you don't like ripping paper off your stitching, this is not the technique for you. If you're not careful, the ripping process could damage some of your stitches. Let's begin. First, load the CD into your computer. There are no special requirements for this software, because it's only .pdf files, not executable software. For those of you that don't speak geek, that just means this is super easy and won't take any thinking or special steps. Most computers already have Adobe Reader and that's all you need. So, load the CD and open the option called Half Square Triangles. First you'll see very detailed instructions with excellent photos. You'll also see a comprehensive list of all the sizes of triangles that Brenda provides. Scroll down to the size of Finished HST you want and print that page on your home printer. Print as many copies as you need. We used regular printer paper. We're making 1 1/2" HSTs and that particular page fits 24 HSTs! What "Finished" size you will get from this page. What size the paper pattern should measure, to be sure your printer didn't shrink or enlarge it....you should definitely do this! It tells you exactly what size the outside lines of the page should measure, and ours was exact without making any printer modifications. How many HSTs you'll get from this page, so you'll know if you need to print more. Now, notice there are dotted lines and solid lines. We'll be sewing on the dotted lines, then cutting on the solid lines. More on that in a moment. 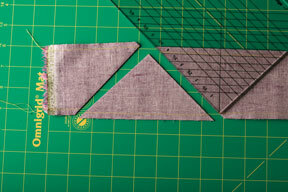 Next, cut two pieces of contrasting fabrics approximately the size of the paper pattern. In our example, we cut larger than the paper so you could see it, but you can save fabric and cut it just 1/4" larger than the outer lines. Right Sides Together (RST), layer the two pieces with the lighter side on top. You'll see why later. Add the paper pattern on top and pin. Place the pins strategically so they are not in the way of the dotted lines, so you won't have to move them when you begin stitching. Now you stitch. 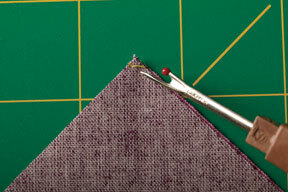 Set your sewing machine stitch to a smaller stitch. Brenda suggests 18-20 stitches per inch. Our machine was digital and we set it to 1.5. She also suggests using a size 14 sewing machine needle. Both the thicker needle and the smaller stitch size will help perforate the paper so it will tear off more easily, much like when you foundation paper piece. Notice all the dotted lines on the paper pattern are continuous! You just keep on stitching the entire page, stitching right on the dotted lines. Time to prepare our blocks for ripping off the paper. Notice the paper is still attached, and is on the light fabric (because of our careful planning in the beginning). Lay the block paper side down and finger press the seam open. Notice the bias is protected because the paper is holding the light side steady. Brenda suggests "aggressively" finger pressing, using either your thumbnail or a finger presser, but does not use an iron at this point because the inkjet letters on the paper could run. Time to rip! Hold one thumb firmly over the center of stitching. This is to protect the bias and the stitching when you tug. Now tug the paper firmly, starting from the center and working your way out. This also protects the stitches at each end from coming undone. Finish ripping off the slim section of paper, again starting from the middle and working your way out. Ta Dah! This makes great TV work. Do all your stitching, then pop in a good movie and rip away! 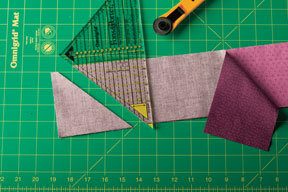 Pros: This ruler takes you through all the steps to making HSTs and Quarter Square blocks. It also works very well if you like to make your HSTs oversized and trim them down. 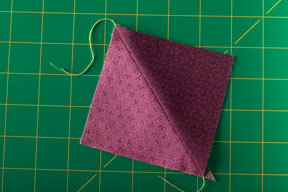 The center section has a nice squaring up feature that helps you make your HSTs perfectly square. This method is great if you don't trust your 1/4" seams! Cons: You still have to do a little math to determine what size to cut your fabric initially. First, lets take a little tour of the ruler. Looking at the photo below, see the far left side has an open space to mark your 1/4" stitching lines. The far right side has a cutting guide for your rotary cutter to cut the square in half. And the center section allows you to square up your HST perfectly. Start with the size square you want. The complete instructions included with the ruler remind you of the special HST formula. For an unfinished HST that measures 3", you'll cut these two squares at 3 7/8" square. Cut two of contrasting fabrics and layer them Right Sides Together (RST). Lay the ruler on top of the lighter fabric. Using a fine marker, draw down both sides of the opening. This gives you perfectlyl spaced stitching lines. 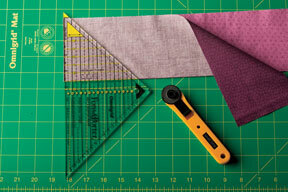 Layer the Perfect ruler on the block, this time using the cutting guides on the right side of the ruler. The dotted lines of the ruler lay on top of your stitched lines of the block, allowing the cutting guide to be perfectly poised for your cut. 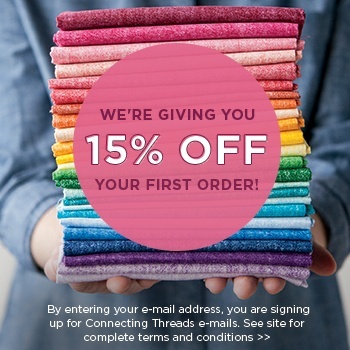 Make the cut and you'll have two HSTs. Carefully press open. If you've ever made HSTs, you know they simply don't turn out exactly square. Fabric is flexible and has a life of it's own. 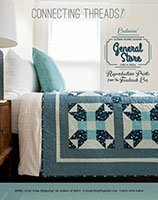 Using the center section of the Perfect ruler to square up your block will ensure it's ready for piecing into your quilt. Use the guides to lay your block under the ruler. 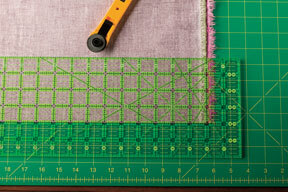 Find the cutting guide and using your rotary cutter, trim up any little bits that keep your block from being perfect. We only had teeny tiny bits, but it made a difference. This step also cuts off those little ears that get in your way later. After you cut, rotate your block to trim up the other two sides. A perfect Half Square Triangle block!